3804 Cracker Way, Bonita Springs, FL.| MLS# 218084862 | Southwest Florida Residential Real Estate for Sale. STILL ACCEPTING BACKUP OFFERS. 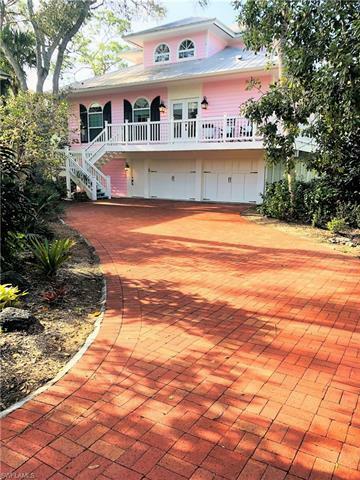 Stunning newly renovated Key West style home offered in the charming neighborhood of Cracker Cove, Bonita Bay. A true tree house sanctuary, this home offers unlimited living flexibility starting with a private 640 sq. ft. (not in Sq. Ft total) ground floor 2-bdrm, 1 bath guest suite complete with living rm. area and garage laundry. Garage fits 4 cars! Take your private elevator to the main living floor which opens to expansive views of a nature sanctuary. This floor features an open kitchen/living/dining area, guest bedroom, den/bedroom and guest bath. Walk upstairs to your master bedroom in the clouds, featuring a large walk out deck, walk-in closet, laundry closet and gorgeous master bath with two vanities, soaking tub, and large shower with 3 shower heads. Enjoy the sunset on the beautiful west facing 2nd level deck. Cracker Cove is a unique enclave of 37 Key West style homes set in a lush natural Florida landscape. This neighborhood has transformed over the last few years with new streetscapes, community pool and use of bright key west colors bringing in buyers who have renovated and transformed these homes into the unique neighborhood of today.